On a typical fall Saturday afternoon in Ann Arbor, Michigan, “The Big House” is awash in a sea of yellow and blue shirts, hats and other spirit wear. With the capacity to hold more than 109,000 fans, Michigan Stadium — the home of Wolverines football — is without peer in the United States. But it is like many college and pro football stadiums around the country in making a greater variety of gluten-free concessions available. 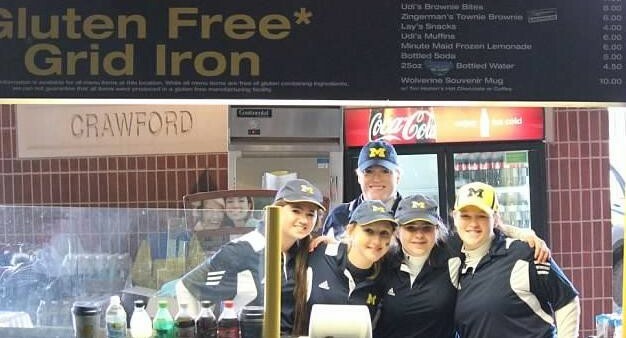 At Michigan Stadium, traditional foods like hot dogs, burgers and nachos are served at two “Gluten-Free Grid Iron” stands. Fans can also find ancient-grains brownies from legendary Ann Arbor deli Zingerman’s and Udi’s muffins. David Ablauf, an associate athletic director at the school, says that concessionaire Sodexo intends to expand on the concept for this season after receiving an overwhelming amount of positive feedback. Schools in the Big Ten Conference, which counts Michigan as a member, are not only standouts on the field but on the concourse, too. At Purdue University’s Ross-Ade Stadium, fans can purchase gluten-free chili-cheese dogs, nachos, protein bars and gummy bears. Last season Levy Restaurants established a gluten-free cart at 102,000-seat Ohio Stadium in Columbus, known as “The Horseshoe,” where Ohio State Buckeyes faithful could order sandwiches and other items. The National Foundation for Celiac Awareness, which has worked with many colleges on safe gluten-free food preparation, encourages schools to integrate their gluten-free dining hall options with their campus sport venues so students with special dietary needs can enjoy the same rituals and activities as their peers, says Alice Bast, founder and president. With both college and pro teams as tenants, stadiums like those in San Diego and Atlanta have to keep plenty of gluten-free fare on hand, especially when hosting back-to-back Saturday and Sunday games. Home of the San Diego State Aztecs and the National Football League’s Chargers, Qualcomm Stadium has a “Gluten-Free Zone” cart with hot dogs, cookies and candy. The Georgia Dome, where the NFL’s Falcons and the Georgia State Panthers are based, offered gluten-free items like BBQ pork sandwiches and pretzel bites at three different stands last season. There may be no more rabid fans in pro football than those of the Seattle Seahawks. On its way to the Super Bowl title last season, the team famously relied on its “12th Man” — the team’s boisterous crowd at CenturyLink Field. Throughout the Seahawks’ run, fans were able to order gluten-free franks, snacks and beer. “We are trying to listen to the demands of our gluten-free guests,” says Seis Kamimura, executive chef for Delaware North Sportservice at the stadium. In response to guest requests, he’s added hard cider and items from the Flying Apron Bakery, a gluten-free, vegetarian bakery in Seattle. This season at Lincoln Financial Field in Philadelphia, Aramark will add two gluten-free stands serving cheesesteaks, hoagies and other local specialties for Eagles home games. The gluten-free options at M&T Stadium in Baltimore, home of the 2013 Super Bowl champion Ravens, include chicken fingers and sweet potato fries. Gluten-free items are also available at NFL stadiums in Buffalo, Detroit, Green Bay and Jacksonville. Michael Savett is the author of the gluten-free blog, Gluten free Philly. He’s also a regular contributor to Gluten-Free Living.